How History will judge Ferdinand Marcos is not something anyone in the present can say. Senator Ferdinand “Bongbong” Marcos Jr., now a declared Vice-Presidential Candidate, was a guest of the late night news show Bandilâ the other night; and inevitably, the line of questions fired at him had a lot to do with his father, the late dictator Ferdinand Senior, and the Martial Law years. Some of the things he said intrigued me enough to make me want to revisit my History-Political Science college background and write about the points that he was trying to make. As could only be expected, most of the senator’s responses to questions from anchors Julius Babao and Ces Drilon in relation to the regime of his father were suitably vague. One of his responses, however, really captured my interest. The statement judged by History is a tricky one. Who exactly judges anything or anyone in History? I will get back to this question. Meanwhile, allow me to segue to a statement made by President Noynoy Aquino during a media forum hosted by the Foreign Correspondents’ Association of the Philippines. Aquino said in response to a question that he did not think that there has been a resurgence in support among the public for the Marcos family, saying that he had faith in his “bosses,” i.e. the Filipino people. If I may be allowed to interpret that statement, I believe what he was trying to say was that he did not think that the Filipino people will restore a member of the Marcos family – in this case, Bongbong – to the summit – or at least, close to it – of Philippine politics. That may well be true. On the other hand, the Filipino people already did elect him to the Philippine Senate. Anyone thinking of arguing that his support when running for the Senate was likely limited to certain regions over which the Marcos family continues to wield influence had better be reminded that in this oft dysfunctional democracy of ours, a definitive majority is not even expected or needed to reach a national public office. In the late eighties and early nineties, a member of the Marcos family returning to a public office of a national scale was not even thinkable. However, it has been three decades since the People Power movement that forced the Marcoses to flee; and the number of those in the electorate that has personal knowledge of Ferdinand Marcos Sr. and the Martial Law years continues to decline with each passing year. Attitudes, after all, change over time. Suffice it to say that whatever chances Bongbong Marcos has of winning the Vice-Presidency ultimately depends on how much current attitudes have changed towards his father. Even if he loses, the elections at the very least will offer him a numerical measurement of whatever changes in these very attitudes have occurred. The point here is that a ‘mere’ three decades from the end of Marcos’ regime, attitudes have already vastly changed from what they were in the immediate aftermath of his fall from grace. This brings us back to the question of just who will judge anything or anyone in History; and in the context of this article, Ferdinand Marcos Sr. This was the very question we History majors were asked back in college. The answer we were given was not easy to comprehend; and whether you are for or against the Marcoses, you will in most likelihood not like it at all. History, we were told, makes a judgement on a person or event only when everyone who has in one way or the other been impacted by that person or event has died out. Therefore, how a person or event is eventually judged by History is when judgement can be passed with crystal clear eyes. This can only happen when those who look at History can do so untainted by any emotional bias for or against a person or event and able to see that person or event in light of how History itself evolved through the continuum that is time. For example, Richard the Lionheart of English History was actually an absentee monarch who preferred to go on religious crusades in the Holy Land rather than govern over his subjects. In retrospect, or so History tells us, it was his absenteeism that gave the barons the experience to govern in his absence. 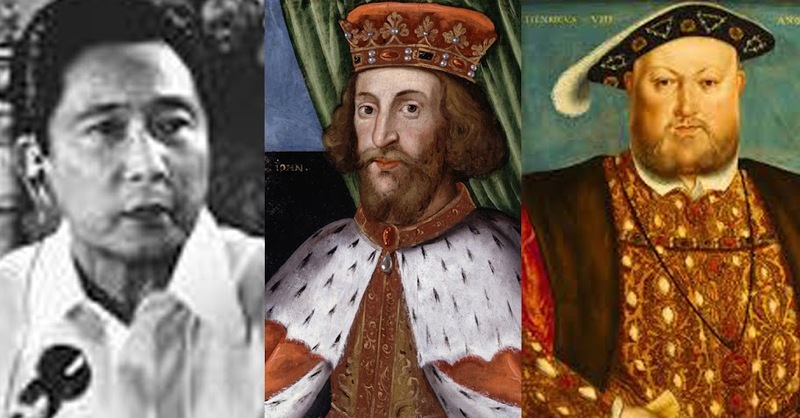 These very barons, because of this experience in governance, would later demand of Richard’s brother and successor King John what would eventually be known as the Magna Carta. This was a document that contained rights of the barons but would also be the basis of the democratic movement in succeeding centuries. Staying with English History, Henry VIII was a vainglorious monarch who had his second wife Anne Boleyn beheaded so he could marry Jane Seymour. Whisper it quietly, but historians suspected that he likely died of an STD. Yet, History also remembers him as a monarch who gave a lot of thought to the separation of Church and state; and was brazen enough to remove the English Church away from Rome and found the Anglican Church. To get back to Bongbong Marcos and his admonition that it is best to leave it to History to judge his father: he had a point. How exactly History will judge Ferdinand Marcos Sr., nobody alive knows, for that judgement, or at least according to my own college History professors, is centuries into the future. For all we know, History will be kind on him. Aquino had better not be too cocky, either. The Marcoses may in the current day be something of an archenemy of the Aquino clan; but there is really no guarantee that History will look upon the Aquinos in a more kindly way than it will the Marcoses.